October is fast approaching and with it comes one of Hendricks County&apos;s most popular events -- the Heartland Apple Festival at Beasley&apos;s Orchard in Danville. I love this time of year. I patiently await pumpkin-flavored coffees, the opportunity to wear sweaters and of course the changing leaves. But you can actually FEEL fall at Beasley&apos;s in October with their crisp apples, bright pumpkins and freshly pressed cider. 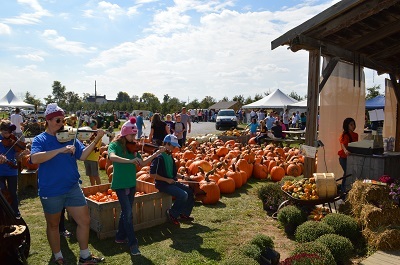 Beasley&apos;s Heartland Apple Festival is a much anticipated event that offers family-friendly fall fun over two weekends -- Oct. 3-4 and 10-11. All four of those days, the festival goes from 9 a.m. to 6 p.m., at 2304 E. Main St., Danville. Parking during the festival is $5 per vehicle. If you&apos;re a returning guest or you&apos;re planning to visit for the first time, you&apos;ll find all the popular attractions as well as some new additions this year. A corn maze, hayrides to the pumpkin patch, a hay mountain, activities for the kids, arts and crafts vendors, great food and live music are just some of the things that make this festival one you won&apos;t want to miss. This festival provides enough entertainment to spend an entire day there, though some families come back for additional days. The folks at Beasley&apos;s are excited about this addition to the festival. This area was designed for the kiddos, but with the whole family in mind. The ball zone, where guests can test their accuracy at football, baseball, and basketball booths, is a welcome addition that Beasley&apos;s hopes will provide fun for the whole family. Another feature is a giant, inflatable pillow that holds 22-35 people - think bounce house floor dug partially into the ground. Let me tell you, friends, I saw this area the other day and I&apos;m really glad that it isn&apos;t a kids-only zone. Other features include a rope web for climbing, a giant corn crib - think sandbox, but corn in place of sand, face-painting and balloon characters. Price for one-day access is $6 a person for ages 3 and older. Children ages 2 and under are FREE. This attraction is included with a wristband combo for $12 a person. The theme for this year&apos;s much-anticipated corn maze will celebrate the 50th Anniversary of the Ford Mustang. The intricate design of "Mustang Muscle" will provide over four miles of maze pathways. Guests will be provided with a passport to help guide them. Answer a question correctly, and you&apos;ll be navigated in the right direction. Answer it incorrectly, and you&apos;ll be sent down a longer path. There&apos;s only one way out of this intricate maze. Completing the maze takes 30 minutes to an hour. Tickets are $7 a person for ages 3 and older. This attraction is also part of the wristband combo being offered this year for $12 a person. The wristband provides unlimited access to Barnyard Bonanza, the hayride (more on that in a moment) and corn maze. The corn maze is set to open Sept. 25, even before the festival begins, and will remain open through Oct. 31, long after the festival ends. Hours of operation on the non-festival weekends are 10 a.m.-5 p.m. on Fridays and Saturdays and noon to 5 p.m. on Sundays. Nothing says fall like a good hayride. The only thing better is a hayride that takes you to a pumpkin patch. That&apos;s just what you&apos;ll get at Beasley&apos;s during the festival. 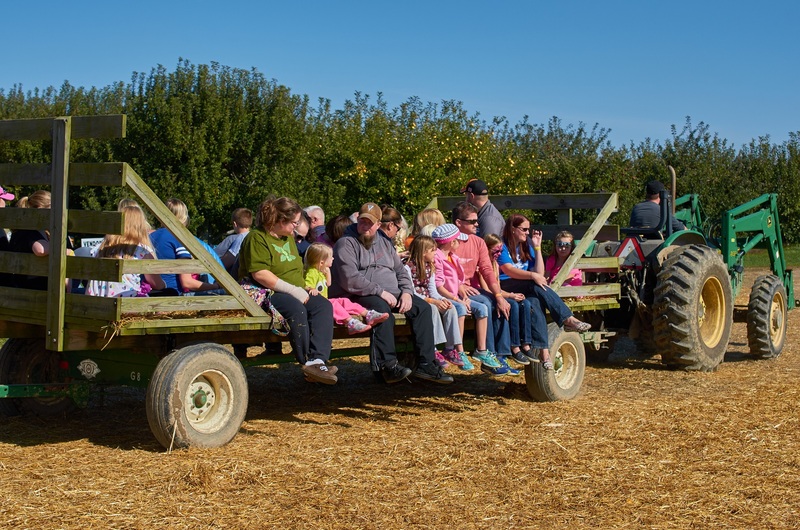 Their tractor-pulled hayrides take guests on a scenic tour of the farm to their 15-acre, U-Pick pumpkin patch. Hayrides cost $3 a person for ages 3 years and up. Children under 3 are free with an adult. This attraction is included in the wristband combo for $12 a person. Pumpkin prices are based on size -- average-sized jack-o-lanterns range from $6-$10. If you can&apos;t make it out to the festival, hayrides to the pumpkin patch are offered throughout the month of October. Click here for hours and information. Of course there is going to be a lot of great food available at the festival. Hello, honeycrisp. The 150-year-old barn at Beasley&apos;s is home to their apple production and cider mill, as well as their produce and grocery market. You won&apos;t want to leave without taking a stroll through the aisles, stopping by their fresh cider bar and picking up a bushel or two of your favorite apples. Outside the barn, you&apos;ll find all the crowd pleasers. Vendors and menus include: ribeye sandwiches by St. Augustine Church, pork burgers by the Hendricks County Pork Producers and homemade apple butter and fried biscuits by Boy Scouts Troop #302. The Heartland Marketplace area will feature arts and craft vendors, animal rescue groups and FREE wine tastings from local wineries. Returning guests, tell the kids not to worry. The beloved Hay Mountain is back again for them to climb to their heart&apos;s content. It&apos;s tradition in our family. I always take a dozen photos of my children on this sky scrapper of hay bales. Live music and a puppet show also will be featured throughout the festival. If you can&apos;t tell, I love fall. And as a local, I think we&apos;re lucky to have Beasley&apos;s and the Heartland Apple Festival in our own backyard to enjoy fall at its finest. Come on out to the Heartland Apple Festival, and you&apos;ll feel fall!